Chrono Trigger has one of the most memorable soundtracks in a game. Looking through all the arranges of Chrono Trigger music, it becomes clear that the most popular of these is “Corridors of Time” (also known as “Chrono Corridor”). With more dedicated mixes than any other on OCRemix (12 to “Schala’s Theme” which has 10) and a popular choice among doujin arrangers, “Corridors of Time” is a good fit for “most memorable piece from Chrono Trigger.” So how does Yasunori Mitsuda do it? First, he establishes an underlying melody using the mystic, ethereal bells playing four notes in a series of four bars, each beginning with a slightly higher note than the next (it is interesting to note that “Schala’s Theme” uses a similar set of notes – 8, to be exact – in a different melodic structure, so the two have a similar level of memorability). This pattern is repeated throughout the entire piece, and the tones selected are pleasing to the ears. There is also a nice echo to the bells, which becomes clearer in the DS version (above). The constant repetition creates a meditative feel (though I suppose alternatively it could make you go mad if repeated long enough!). Thankfully, more variation is added 10 seconds in with some groovy-cool bongoes and almost-liquid drums. Atop this is layered the main melody, beginning at 0:18, with a fine exotic transition. I’m not sure what instruments are used here, but this outlines another key factor to Mr. Mitsuda’s music (particularly this song) – exotic instruments that give the music a unique feel. Bells, bongoes, and hippy guitar – though perhaps it makes us want to ask whether the people of Zeal are meditating on the secrets of the universe or ‘meditating’ on hashish. At any rate, the unique sound of the instruments aids in memorization. Next, the melodic structure. Here, the first half is comprised of easy notes that maintain a dominant key, returning often to the same two high and low notes with low range, creating two distinct bands of repeated notes that make the melody simple and easy to recognize – but also achieve a set tone that has a meditative quality. It is also important to note that the bottom note in the tonal key has longer notes that are repeated more often, creating emphasis. In the second half, the guitar is replaced with a female choral line. In juxtaposition with the first half, the choral line plays long, high notes, creating a nice contrast in both instrument, scale, and pacing. I also think these high female chorals are distinct and memorable. Finally, “Chrono Corridor” establishes a tone and emotion that is also distinct and memorable. It is played in a minor chord that recalls something in the ancient past, an exotic location with warm skies where meditation is the primary pursuit. However, the people of Zeal have become so engrossed in their magic and studies up in their guru cloud they have forgotten the people on the snow-covered earth. So while the music seems to have its head in the clouds, there is a sadness here that is ignored – the loss of the earth, a loss of sense of reality. There are a lot of mixes to “Chrono Corridor”, so it is very difficult to go through them all and find out what are worth the listen. One standout piece is “Corrupter of Time” by Jordin de Bruin and Tweak, a nice rock mix (it’s possible!) done in the style of Metallica. This is four minutes of rock-out with Schala and the Nu’s (I’m calling that their band). Final Fantasy Mystic Quest (aka Final Fantasy USA, 1993) is the poorman’s RPG for the SNES. Retaining only the title and the publisher of the famous series, Mystic Quest has absolutely nothing to do with the Final Fantasy series, including a basic battle system with some action elements. While the soundtrack is nowhere near the quality we’ve expected from other Squaresoft titles, there are a few notable tracks such as “Mountain Range of Whirlwinds,” “Battle 1” and “Battle 3”. Though I feel “Battle 3” is the best composed piece from the game with its nice layering, dynamics, and instrument combination of strings, guitar, and bells, “Battle 1” is the most memorable of all the tracks (and a nice composition to boot!). After opening with a guitar drive into the arena and a short guitar opening, “Battle 1” moves to a trumpet section punctuated by bells, followed by a nice break to a mellow synth line and bell section. The final section contains a nice layering of the guitar, drums, and two synth lines for the most dynamic section of the song. “Battle 1” is intense, assaulting with heavy guitar and containing plenty of support from bells and strings; Ryuji Sasai is not afraid to smoothly switch between a guitar lead and different synth leads to produce a very progressive rock track with a well-defined melody that, in short, is just the kind of battle theme that made the game memorable. Once you’ve heard something like this even a half-dozen times in-game, the memory is there to stay, instantly recognizable even years later. The game was composed by Yasuhiro Kawakami (Drakhen, Crisis Core: Final Fantasy VII) and Ryuji Sasai (Final Fantasy Legend III, Bushido Blade 2), definitely not main composers for Squaresoft, but ones who seem to have put in a few heavy titles. Mr. Sasai composed the Battle themes, and his work is outstanding. Mystic Quest saw one remix album, Misstik Kwest by the folks from Overlooked ReMix. The mixes are mostly garbage/joke tracks (such as Christian Pacaud’s “Meow Meow” mix of the “World”/Main Theme) to the bizarre (“My Sax Fell Into The Volcano” by Xenon Odyssey) but here and there some good pieces such as “And he returned home” by Diggi Dis and “The Ramones Meet Jimmy Page” by t3h real adam d. Most of the album though is not very good and the tracks are not in any particular order. Sadly, no notable mixes of the battle theme. This is the first Daily by Jeremy Soule (pronounced like ‘cool’), and it is from his premier soundtrack, Secret of Evermore (1995; HG101 also has a great overview of the game). This unique title was created by Square USA as one of the few SNES RPGs that never saw release in Japan. The game is about a young kid from the ordinary American town of Podunk, who opens up a portal to an alternate world created by scientists in the 1960s. The boy and his dog travel through time, beginning in the prehistoric era and heading through the ancient Mediterranean and Medieval era to the future. Along the way, the boy gives hard-earned wisdom from countless the B-movies he’s seen. The game featured a real-time battle system similar to Secret of Mana/Seiken Densetsu, but featured an alchemical magic system rather than a mana-based system. While there are many great songs in the game, I have to pick “Greek Temple” (aka “Collosia, Chamber 1”) as my favorite. Oh yeah, the album also has awesome cover art that doesn’t look a thing like the boy from the game! “Greek Temple” plays in a giant temple to the south of a bronze-age city modeled loosely after Ancient Greece. The harp and strings provide a cool, atmospheric base to the dark temple, filling the long corridors that fade into darkness. The flute adds highlights to the space, whistling through the dark to evoke curiosity and wonder. Some buzzing percussion (0:54) adds to the spell and makes full use of the stereo. Soft and calming, “Collosia, Chamber 1” is certainly a keeper. 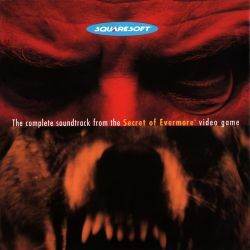 Soule arranged the track in the official Secret of Evermore album. Soule’s debut soundtrack is amazing. A good number of the tracks in Evermore are quite memorable, just as the game itself stands out for its uniquely American feel so many years later. Read the rest of this entry ?